Looking for an alternative to expensive camera gear? Learn how to use your smartphone to take amazing apparel product photos. If you’ve been following our Smartphone Photography blog series, you probably caught our recent article about how to create beautiful mobile images of furniture. In that post and in many others, we concluded that publishing great product images is a crucial step toward making money online. Product photography is a gateway to customer satisfaction, leading to higher traffic and, ultimately, to higher profits. You might not have a mountain of resources at your disposal, but trust us: you most likely have tools to create amazing product photography right at your fingertips. How is that possible? These days, cell phone manufacturers are equipping even mediocre smartphones with high quality cameras that boast 8MP and even 16MP of resolution. This means sharper, clearer photos and better colors. It also means that you can minimize the costs of producing high quality product photography, provided that you know how to operate your smartphone camera to its full extent. In this article, we’ll show you how to do just that! Repetition is key in product photography. Understanding the importance of consistency will help your product images excel in both technical quality and composition. Pay attention to every detail and decision that you make throughout the process and record every one so that you are able to reproduce exactly the same resolutions every time you set up and shoot. Before you can get started, you will need to own and understand how to operate your smartphone and its camera application. You may choose to use your phone’s basic camera app, which will come pre-installed on the device, or you may choose to download an advanced camera application with more features. We recommend using Camera+. This app is cost effective and will allow you to exercise a greater amount of control when compared to basic camera apps. Whatever app you choose, it’s important that you become more than familiar with its various settings and capabilities to ensure that you are getting the best images possible. If you’re having trouble, follow this detailed step by step tutorial for various manual smartphone tips and techniques! Most of us are strapped for time and require quick turnaround when it comes to our product images. For this reason, it’s smart to have everything ready before you begin shooting. This practice will help to streamline the process and ensure that you don’t forget any critical steps. Make sure that your product has been thoroughly examined and cleaned. In the case of clothing, ensure that the garment in question is wrinkle-free and is accurate in its representation. A lot can happen to a product during storage and transport, so be sure to check all buttons and threads thoroughly. Styling a product on a mannequin or live model can really help it to come alive. Both mannequins and live models are great investments to make, especially since you’ve saved your equipment budget money by utilizing your smartphone as your camera. If you’re in a pinch and don’t have the funds to hire a model or buy a mannequin, try modeling the product yourself! Many camera apps on smartphones come equipped with self timers that can enable you to easily take self portraits. It is crucial that you produce bright, well-lit product images. For one, customers hate dimly-lit product images — and worse, bad lighting will make your products look dingy and dirty. Good lighting allows customers to see your products in full detail, which will give customers confidence in buying from you. If you can’t find enough natural window light, try using artificial light from lamps and fixtures instead, or use white foam core or poster board to bounce light onto your product. Not only should you choose a place in your house or studio that contains enough wall space and light, but you should also select a shooting location with bright, neutrally-colored walls or somewhere that it is easy to install a temporary backdrop. Depending on your product’s colors, white, grey, or lightly-colored walls are generally best because they allow products to stand out, emphasizing colors and textures. For Example: you should photograph a white garment against grey walls (as opposed to white walls) and photograph darker garments against either white or grey. Finally, it is a good idea to research other similar product photos to see how successful competitors are displaying their products. Take notes on what works and what doesn’t work and come up with a list of things you’d like to incorporate or avoid in your own work. And while you’re at it, spend some time exploring and learning the eCommerce site you are planning to use to list your products. Do all that you can to learn the specific requirements of each platform. Every detail counts! 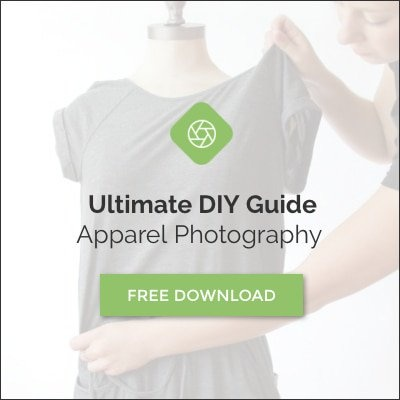 For an all-in-one example of how best to photograph apparel, take a look at this product page from Etsy. This may seem like a no-brainer to many of you, but focusing is so important that we just had to list it. Don’t forget to focus! Simply touch your phone screen on the center of your apparel and your smartphone will do the rest of the work for you. Without proper focus, your customers will only see a blurry view of your product and may even question your integrity as a seller. stealing positive attention from your product. Your customers are really only going to be concerned with one thing: getting the best views of the specific products they’re considering for purchase. After you have created images of a product from several different angles, then zoom closer and feature the details that make the item special, such as tags, logos, buttons, and material patterns and textures. Remember, the product should look exactly like it is in reality. Show any detail that will help him to visualize what the product would look like if they were actually examining it in person. New items should be in perfect condition, but second hand products sometimes sport some wear and tear. If a product that you’re looking to sell contains damages, be straightforward with your customers and include an image of the damage. Just remember to highlight the exceptional qualities of your piece first and foremost. It’s important to keep your mannequin or model in the same spot throughout all of your shooting, even if you change out the garment being photographed. The easiest way to ensure consistency, mark a spot on the floor with tape for the mannequin or model to stand on. To save yourself some time later on, make sure that the images that you create are straight and cropped exactly how you want them to appear online. This way, you won’t need to spend time making these adjustments in post. Avoid experimenting with shots. Images with straight shooting and the right cropping are the best choice to appear online. Once you are finished photographing, load the images into a mobile image editing application such as Adobe Photoshop Touch or Camera + (as we suggested at the beginning) to tweak brightness, contrast, sharpness, and other basic levels. This is not a crucial step, but adjusting these settings can definitely add more “pop” to your images, which sometimes makes all the difference in a customer’s decision to purchase a product or move on. If you don’t have the time or know how to edit the images yourself, you can always send them off to a professional outsourcing company who can really make your image(s) shine. Here at Pixelz, we can take your quality images and edit them even further to create truly stunning product photos with pristine backgrounds, beautiful colors, and crisp sharpness. With our quick turnaround guarantee, your images will be web-ready in 24 hours or even less. All that’s left after editing is to upload your images onto your eCommerce website. Depending on the platform that you use, you may be able to upload the images straight out of your smartphone’s camera application by syncing the app to your photo album. Websites like Chairish and Etsy both have smartphone apps that you can utilize on the go. Each app is set up differently, but takes no time at all to learn, so select your favorite and you’re in business. Want to learn how to photograph different products with your smartphone? Check back with Pixelz’s blog very soon to hear more on how to quickly make money by producing excellent product photos! And if you haven’t already, check out the first article in our Smartphone Photography series on how to photograph furniture with your phone like a pro.